These notes come from a talk I attended earlier today at the National Library of Australia on building online communities. The speaker was Chrystie Hill, Director of Community Services at WebJunction.org, from Seattle, WA. It was interesting to hear about her journey as she spoke using stories, and didn’t just regurgitate facts. See The Great Good Place by Ray Oldenburg is about connections between people: pubs build communities. She also spoke of John Seely Brown and The Social Life of Documents (on FirstMonday): documents build communities. And Bowling Alone by Robert D. Putnam and the decline of civic engagement & social capital in US: capital and networks build communities. Is your library relevant to you (& your needs)? She said hers wasn’t (at the time) and her most important need was to know what her friends were doing: individuals build communities. Libraries were not accepting their role as community builders (maybe they still don’t understand that role at all?). But US public libraries became carriers for public Internet access in the 1990s. Eventually home and work use of the Internet also grew. People soon began to find themselves on the web – publishing, subscribing & sharing. It became a story of communities and collaboration on a scale never seen before. Now libraries (& librarians) have to be involved to stay relevant. It is about conversations. It is about people who are saying “here is what I am doing”. People sit behind all the tools and experience. It is also about what your friends are doing. So many tools are now available that it can seem overwhelming, so step back and look at what is behind it all. So, where is the library? People are finding their own answers easily on the web themselves. Library use is going down while use of email, online bookstores and search engines is going up! Can libraries cope where the stuff isn’t completely organised or controlled? Probably not. Many public libraries are closing in the US because they lost their relevance and then they lost their funding. See Content, not Containers (an Information Format Trends report from OCLC, 2003). Do libraries just = books? Do our users think of us for other information needs? Do we just stop making it feel like church? 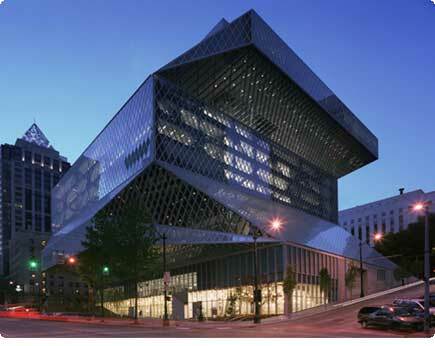 She then went back to the new Seattle City Library (image appears above in this post) and said it is what a library should look like (if only!). Real visitation went up 300% in its first year. Public access computer use quadrupled. Its spaces are very inviting and its services are very innovative: multi-lingual programs; online assistance; teen services (via MySpace) – with 50% boys participating!. They are building communities daily and get 1,000s of teens involved. She said we must do better jobs in all libraries. Online tools help us to see our roles as connectors, facilitators, and community builders. Currently, Chrystie is writing a book and blogging (one of several). She spoke for a while about the work of Webjunction.org – helping to build relevant vibrant, sustainable libraries in every community. Most content comes from members and partners. All of it is wrapped around social engagement. Public access computing and personalisation services were key to this and to building real communities. Learn: active learning is encouraged, staff/members are surveyed – What was your greatest achievement last year? (part of bi-annual member survey on webjunction.org – results were visually presented in a tag-cloud), speaking engagements, blogging internally and externally encouraged for all staff. So what does this mean for us at the Memorial? I think we are heading in the right direction. We are not there yet, but we’ve made a good start and even though we might complain about some restrictions placed on us by out IT staff, they have already facilitated much more freedom and innovation in our organisation than many, may others (judging by the tone of questions asked of Chrystie). Our management too have been both supportive and visionary. How many national cultural institutions can boast that they now have these words as their first listed corporate priority for the 2008-2011 period: “Enhance online access through use of emerging web technologies and improved web content”? Compared to many people elsewhere (in the goivernment, cultural and education sectors), we don’t really seem to suffer from the same restrictions on internet access. AWM staff have access (for work purposes) to sites such as YouTube, external blogs, Facebook, Flickr, Ning, etc. Access is granted in order to encourage staff to learn about the use of and possibilies for us to use social media. We have our own blogs, using WordPress (eg. http://blog.awm.gov.au/), but the content on those are usually kept to posts about our collections, exhibitions and military history.Just a personal opinion here, but I often think that the last people who should be making internet access decisions in organisations are the IT staff. I always get lazy taking notes when I know you are there – you do such a good job. It’s a great summary of her talk. Wow! This is a great summary of my talk. Thank you so much for the notes and for your commentary on how your library is doing.My sense from my travels in AU while I was there (very short time) is that your situation may be exceptional. Everywhere I went, people asked me questions about how to get and retain access to the Internet and to tools of the participatory Web; this has been a problem in US school libraries (still is) but public libraries generally have access (but may still have their own limiting policies). Thank you for leading in many ways for other libraries. Having examples to draw from – even when we “fail” – is extremely useful to libraries trying to make the case for continued access, experimentation, and evolution towards retaining our relevance to the communities we serve.Please, keep in touch! Cheers. oh no! nothing new!? i guess i’d better get back to work – for my next trip to oz.